Cytomel T3 (Cytomel; generic name Liothyronine Sodium) from Abdi Ibrahim is used for treating low thyroid function. Cytomel T3 (Cytomel; generic name Liothyronine Sodium) from Uni-Pharma is also used to treat or prevent different types of goiters, as an aid to diagnose certain thyroid conditions, or to treat patients who are allergic to other thyroid medicines. Cytomel may also be used for other conditions as determined by your doctor. 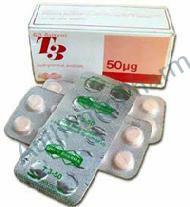 Cytomel T3 (Cytomel; generic name Liothyronine Sodium) from Abdi Ibrahim is a Thyroid hormone. Liothyronine Sodium works by replacing or supplementing the natural Thyroid hormones in the body. Adverse reactions, other than those indicative of hyperthyroidism because of therapeutic ovserdosage, either initially or during the maintenance period are rare. In rare instances, allergic skin reactions have been reported with Cytomel (liothyronine sodium) Tablets.